On our recent trip to Atlanta, we visited the Fernbank Natural History Museum. We wouldn't have gone except that our membership at the North Carolina Museum of Life and Sciences allows us to get in for free. Normally it's $15.50 per child and $17.50 per adult - a savings of $66. When I visit museums in places outside of the Raleigh-Durham area, I usually come away feeling thankful that we have such good quality museums and that they are very reasonably priced. This experience was no exception. That being said, the Fernbank NHM had some great exhibits and we really enjoyed our visit. My favorite exhibit as well as the kids' was NatureQuest. This highlight was essentially a huge playhouse setting with a nature theme. The detail of this place was truly amazing. This promotional video doesn't even do it justice! 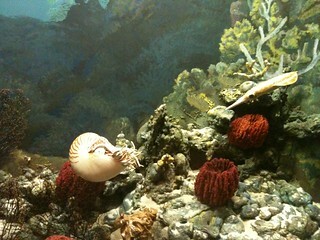 A great little gem tucked away on the lower level near the IMAX entrance is the World of Shells exhibit. 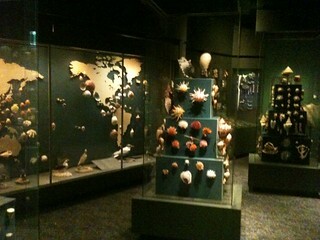 I really enjoyed this display of shells from around the world. Of course, squids and nautilus are in the same family so Jonah enjoyed this section as well. There was also the token dinosaur skeletons in the atrium and the Walk Through Time in Georgia Exhibit was nice. Both kids and adults enjoyed the Sensing Nature exhibit. There were several interactive displays here for us nerdy parents to enjoy. 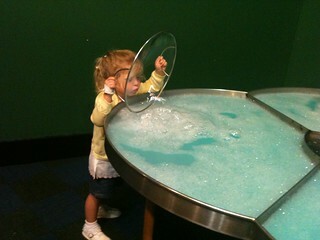 The biggest hit in this exhibit though is definitely the bubble table. If you were to ask the kids their absolute favorite part though, it would probably be the free dinosaur gliders they got in their kid's meal at the cafe! They played with them consistently the rest of the visit and also when we got back to the campground.